Intercom helps you have real-time conversations with your customers. It is the go-to tool for your Sales, Marketing & Customer Service teams for smooth communication in a single platform. Chargebee's integration with Intercom will sync customer and subscription information, providing all the information needed to facilitate effective communication. When a subscription is canceled in Chargebee, the latest subscription status of the customer in Intercom gets updated to ‘Canceled'. User and subscription information will not be removed from Intercom. User Model: Chargebee will sync the customers as individual users. Company Model: Chargebee will group all of the users from the same company together, if the Companies feature is enabled in Intercom. If you are using multiple Intercom apps, you can select the app to be used for integrating with Chargebee. After connecting to Intercom, you can choose a model to be used for the sync, it could be either Company or User model. If you want to use the Company model, fill the questionnaire. After filling the survey, we will contact you to discuss the next steps. If you want to use the User model, you can click Proceed. Next, Chargebee will check for duplicate data in Intercom using the email addresses in Chargebee and Intercom. If the customer has the same email address recorded in Chargebee and Intercom, the accounts will be mapped by Chargebee. However, during validation, if Chargebee finds that a customer has multiple accounts in Intercom under the same email address, Chargebee will notify you with an error message. In that case, you need to contact support@chargebee.com to continue with the mapping. In case no errors are encountered or if you are using a clean slate Intercom account, you will be taken to the next step directly. 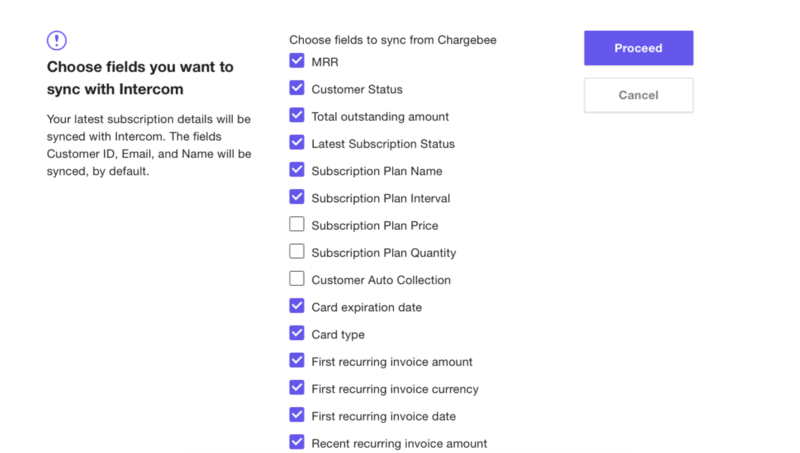 Chargebee syncs Customer and Subscription attributes to Intercom. Customer ID, Name and Email attributes will be synced to Intercom by default. You can choose from a list of Customer, Subscription and Invoice related attributes to be synced. You can choose from the list of Customer and Subscription related Custom fields to be synced to Intercom. Auto Sync: This option is enabled by default and the sync happens once in 6 hours, you can disable it at any time and manually initiate the sync using Sync now. 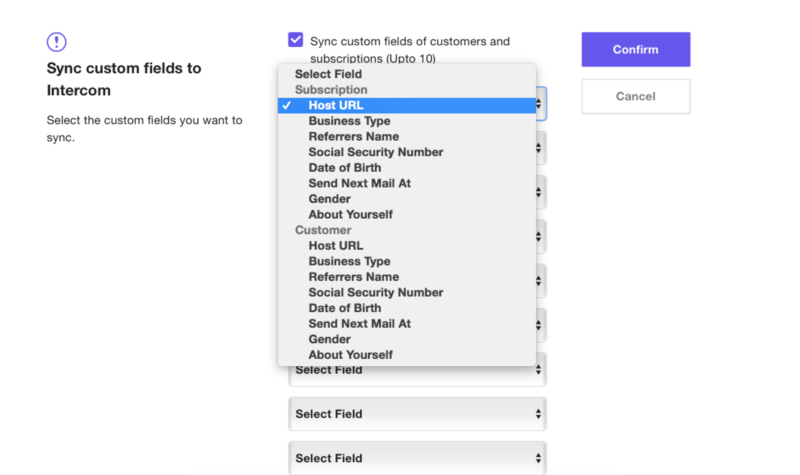 Customer and subscription details fields: Allows you to change the customer and subscription fields to be synced. Custom fields: Allows you to modify the previously selected custom fields. Disconnect: You can disable the integration when required using this option. Chargebee will stop syncing data to Intercom. Data synced to Intercom will remain intact. How do I change the Sync Start Time later? Navigate to Settings > Third-Party Integrations > Intercom. Click on Sync Now and this will reset the Sync Start Time to the time you presently ran the sync. The next sync will take place 6 hours since then. Can I map multiple subscriptions in the Chargebee site to a customer in Intercom? No, only the latest subscription information will appear in your Intercom app i.e., for a customer with multiple subscription, the subscription that was updated latest will show up in Intercom. What happens when I disconnect Chargebee and Intercom sync? Chargebee will no longer sync Subscription and Customer information with Intercom. However, data synced will be not removed from Intercom. What should I do if I want to reconnect after disconnecting the sync between Chargebee and Intercom? To reconnect with the Chargebee sync, you will have to go through the initial setup process once again.